Are you really Catholic? Then Stand and be Counted. This is the time, this is the place, for All Real Catholics to Make Their Stand. This site is all about the formula Culture=Religion+Politics, where Religion must dominate Politics for decent Culture to thrive, assuming the Politics are always to be Representative of a Religious Citizenry. Sinister plots feeding and growing the Kumbaya Time Bomb and the political movement pushing Diversity for its own sake and "Multiculturalism" have been acting to destroy decent culture. America was founded, by Christians, to be Christian. However flawed their Christianity may have been by the heresy of Protestantism, and however the Founders may have differed on Christian Theology, they all agreed on Christian Morality, which, at that time and in that era, was pretty close to identical to that of Catholicism, the One True Church. A reading of their own written words and a reading of their Declaration of Independence confirms it. That essential underlying Christian cultural foundation is what is being destroyed, by plan, by the Cultural Marxism Movement, which now owns and operates the Marxocrat Party, Education, Journalism and Entertainment. And worse, it is tolerated by nearly all the rest of American Culture, including the Republicrat party. Those who actually stand and defend the Constitution against of all this are pitifully few. Cultural Marxism has even dominated much of Natural Science and converted it into Scientism, now "Scientifically" proclaiming the unnatural to be natural, the unproven to be proven, even the unreal to be real, supporting every Globalist Hoax designed to frighten the citizenry and grow the government, to "save" them from imaginary threats. This is real Political Science, driven by the evil politics of Globalism, as is the Multiculturalism Movement. Forcing "multiculturalism" on us against our will is unconstitutional. We, as citizens, have a right to not be forced by law to "accommodate" or cooperate in any way with or have anything to do with the homosexual movement, for instance. And yet, through our now corrupted court system, homosexual activists are able to force their immorality on us against our will, through court action, again and again and again. It's how unconstitutional Abortion became a "right", by "law". It's how unconstitutional homo-marriage became a "right", by "law". Not through Constitutional legislation, but through unconstitutional litigation. Not through Representation, or by Representative government, but done through the unconstitutional (and therefore illegal) adjudication of anti-American Judges and Justices sitting in anti-American Courts. Well, the same Cultural Marxism Movement is corrupting the Catholic Church, too. American citizens are getting pretty sick of hearing the word "Diversity" in their politics. And Catholics are getting sick to death of hearing the overused word "Accommodate" in their Catholicism. It's disgusting. We are now supposed to "Accommodate" that which once was, and still should be, Anathema. You can't put a happy-face on mortal sin, pretend it isn't what it is and just go skipping through life being entertained by "Ellen", going to Elton John concerts and publicly and loudly claiming homos as among your best friends, and not expect to answer for it in your final Judgment. Homos, like Abortionist, Adulterers, Fornicators, Cohabiters, Pornographers, etc., are not supposed to be an integral part of any decent culture, nor are they supposed to be an integral and perfectly acceptible part of the Catholic Church, the members of which are referred to in Scripture as The Elect. I'm telling you, all of this is the destructive work of Cultural Marxism. In the Church, in America and in the larger world. It is Globalist. It is anti-nation and it is anti-religion. It is especially anti-Catholic. So what are we supposed to do, leave America? Leave the Church? Americans with the wherewithal to do it speak of moving to New Zealand or some Island if things get worse, but that will only be avoiding the issue, and putting off global doom until it finally reaches New Zealand or some Island. If you don't fight, you lose. If you run, eventually you still lose. Evil is relentless, and Satan is a Globalist. The "Wicked Men" Michael Voris is referring to here are the Homoclerics and the Cultural Marxists who make up the Catholic Criminal Conspiracy that is now coming undone and being exposed to the light of Truth. I submit that most of the current Catholic Hierarchy, including the highest Cardinals in the Vatican, including Pope Francis, and the American USCCB, collectively, are just as anti-Catholic, in Catholic Doctrine, as the Marxocrat Party and much of the American Court System is anti-American Constitution in American Civil Law. Cultural Marxism is death from within. You cannot be a Marxist and be an American Constitutionalist. You cannot be a Marxist and be a True Catholic. American Catholic Bishops who will not stand up and defend the Church against this onslaught of corruption from the hierarchy itself are worse, in my opinion, than the perpetrators. If they are too timid, too cowardly and too "Accommodating" to speak Truth to Power then they should not be Bishops. They are called to do this; they are called to do battle for the Faith. They are supposed to be leading us. They are supposed to be bold. Even self-sacrificial. But they are not. For the most part, they are just as disgusting as the RINOs and the NEVER TRUMPERS and the WASHINGTON CLUB members of the Republicrat Party. They stand by and allow evil to gain ground. Because of timid, cowardly, uncommitted, undedicated, lukewarm elected Republicrat politicians, the Constitution is going under. Because of timid, cowardly, uncommitted, undedicated, lukewarm Bishop members of the USCCB, the Church in America is going under. Since the Fall, perfection is not of this world, but the next. There has never been a perfect President, and there has never been a perfect Pope. With the exception of the Blessed Virgin Mary, there has never even been a perfect Saint. I submit that President Trump, warts and imperfections and all, in a mere two years has proved to be the best American President since George Washington Himself. Simply because he so loves America. We can pray for a Pope who loves the Church as much as Trump loves America. But we cannot wait for those prayers to be answered. We are the only ones out here on the real cultural battlefield. Someone has to Stay, Stand and Fight. And right now, buddy, we are it. This, right here, right now, is the hill worth dying on. It is now or never. It is Winnowing time. Where do you stand? USA, kinda. The Liberals are quite well organized, and have sincerely taken to heart all the directions of Saul Alinsky. They have elected, in CO, a gay governor, (married with 2 children, God knows how that happened) and replaced every person with an R. behind their name with a DEM idealogue. I weep for the Colorado I used to know and love. MN is long gone, two Muslims elected to key positions by the useful Idiots of MN. The KOOL-Aid has seeped into the Catholic Church also, as you so well point out. 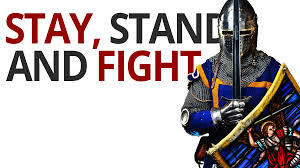 I am ready to stand. I just do not know how to proceed. What would you suggest as a starting point? If you are not Catholic, become Catholic. That is where Truth lives. Join the Catholic RESISTANCE Movement. Wear your MAGA Hat, and wear a big Crucifix on top of your clothes. Send The Letter to your Bishop, and mean it. Get into your local Constitutionalist Movement group, be it a Liberty Group, a Tea Party or whatever name it goes by in your area. Say it loud and say it proud, with your words, actions, appearance, example and the way you live every part of your life.